Janathon Day 15 I am menaced by cows! Look how I am being given the evil eye by this crazy bovine, backed up by his equally aggressive mates. As you can see, I’m only protected by a thin ring of steel with a gate in the middle. So it’s a stand off. It lasted almost three hours until a truce was agreed and they allowed me to pass through the gate and return home. Actually, that’s not strictly true. This picture was taken in October and the cows are expecting to be thrown apples from the apple tree out of shot. Of course if they are denied apples, theoretically a stand off could occur and the long wait to get home might become a reality. You can now appreciate the risks and tricky situations that can arise if you live in the countryside. This is just one (theoretical) example. No apples lying around now. The cows are gone and there was a hard frost this morning. But the sun was shining in a cloudless sky and it was perfect for running. Tomorrow it’s parkrun at Cambridge and the weather should be similar. Last week BBC East came along and their report was broadcast early in the week. It’s likely that more people will be encouraged to come along and last week was a record at 504. Mud, ice and congestion. 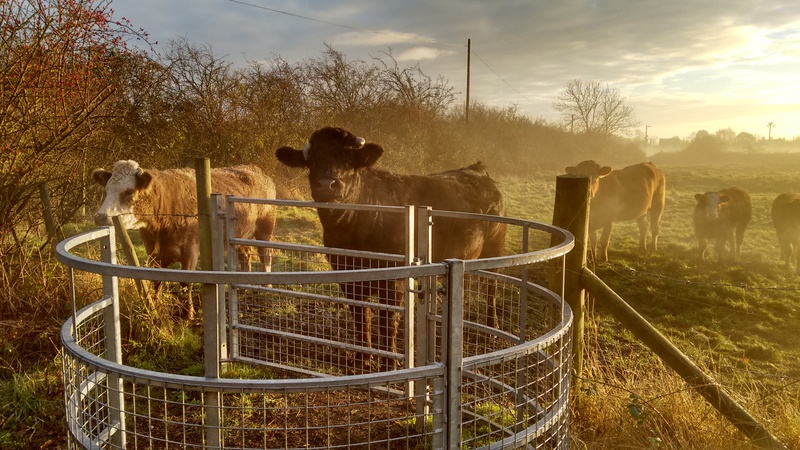 This entry was posted in Am I Being Unfair?, Exercise and heart disease, Janathon, parkrun, Running, Uncategorized and tagged cows, exercise, heart disorder, Janathon, parkrun, running. Bookmark the permalink. That’s a lovely photograph, very turner-esque with the mist and the sunlight breaking through the clouds! Thanks. I give myself top marks for bravery. Might try some cow whispering in the summer.